What drew our attention throughout the last year most? Crises, violent conflicts, terrorism, Ebola and in environmental terms the change of climate. However, attention, driven through media, doesn’t necessarily express the severeness of the issues to which decision makers are turning to. In this context climate change is unfolding now activities to find ways of global participation including poor countries. According to QZ industrialized countries will „spend $10.4 billion helping poor countries cut carbon emissions and brace for the impact of climate change“. At the same time tens of billions a year were and continue to be allocated combating infectious diseases like Ebola, HIV or malaria. 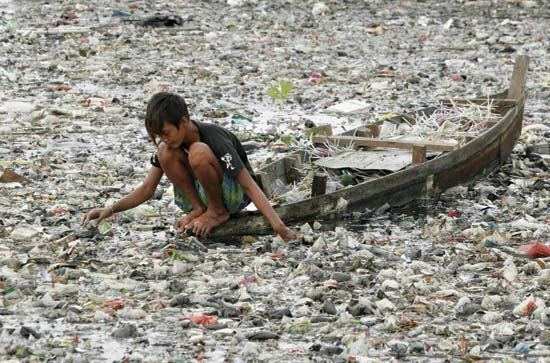 However, the basic necessity on earth to enable a healthy living for people is still hygiene and to fight pollution. Pollution is in fact the „most lethal force on the planet, killing nearly 8.9 million people in 2012„. “Pollution is not a priority concern in poorer countries in part because it’s often invisible to the eye and doesn’t leave a clear fingerprint on its victims,” she says. The effect on human development and national economy is similar to diseases: a child suffering from malaria needs its family’s, in most cases, its mother’s full-time attention. Estimates say that the health consequences of air pollution alone costs low- and middle-income countries 6-12% of their GDP a year. Therefore, the destructive effects of pollution to those induced by climate change and infectious disease should be recognized and require further allocation of funds. According to experts to which QZ refers, pollution problems can be relatively inexpensive to combat. For instance, cleaning up a village’s hazardous waste and educating villagers can cost as little as $20 per person. Amongst the sustainable development goals the UN is considering to adopt as its own agenda „combating climate change and using natural resources sustainably“ are priority. Pollution is almost not mentioned.